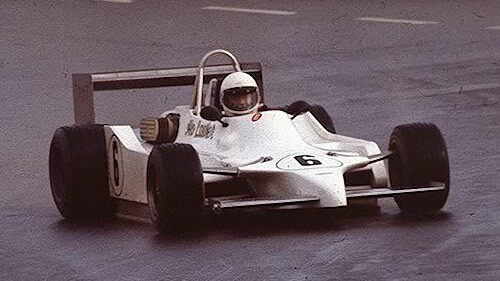 Formula Atlantic's most successful period in the UK had been 1974-1975 which had coincided with a thin period for Formula 3 as it moved from 1600c to 2000cc. As F3 was revitalised, Formula Atlantic lost support, lost its sponsorship, and lost its way. The misguided Indylantic experiment of 1976 hastened its decline and no series was held in 1977. The cars continued in Group 8 that season but after they were thrown out of there too, their only outlet in 1978 was libre racing and the flourishing Irish Atlantic series. After a successful experimental race at Donington in 1978, a new series was organised by the BRSCC for 1979. Despite sponsorship from Hitachi, prize money was poor and support was low although Ray Mallock and Jim Crawford took the opportunity to remind the country of their talent. Alo Lawler won the rain-soaked opener at Mallory Park in the Lola T760 wing car but Ray Mallock dominated the rest of the season in his Ralt RT1, formerly a Ralt-Ferrari F2 car. Crawford was his closest competitor in the ex-Keke Rosberg Chevron B45 with Paul Smith putting in some strong performances in his updated March 782. The results here have been compiled by Chris Townsend using Autosport and Motoring News. Not all the results are complete: in particular two starters at Ingliston 22 Jul 1979 are not known. Full results sheets or details of non-starters are also needed for Thruxton 1 Apr 1979, Silverstone 8 Apr 1979, Brands Hatch 29 Apr 1979, Silverstone 10 Jun 1979, Oulton Park 30 Jun 1979, Donington Park 15 Jul 1979, Silverstone 27 Aug 1979, Oulton Park 8 Sep 1979 and Brands Hatch 14 Oct 1979. Grid positions are generally known but not always qualifying times. Grid sheets or details of qualifying are needed for all races except Mallory Park 11 Mar 1979. Chassis identification is largely from Chevron, Lola and Ralt production records, chassis plate observations by Adam Ferrington and others, details of previous owners of second-hand cars (typically F2 cars which have been identified from F2 reports) plus some fragments of March production records. Argo production records would be a huge help. Lyncar chassis numbering remains an enigma and information on the Wimhurst would be very helpful.